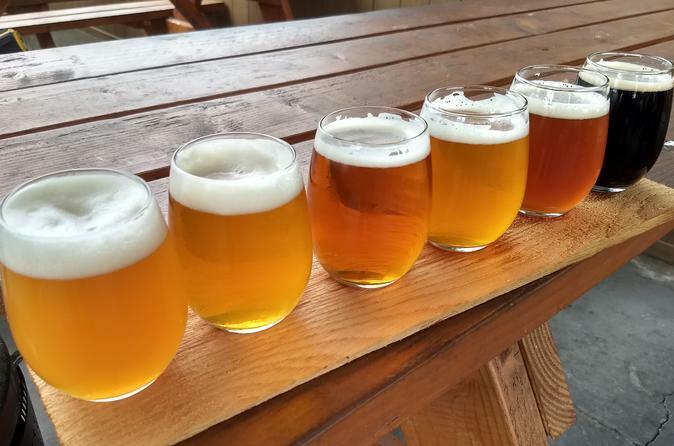 Sample the very best of what’s on tap during this Portland brewery and food cart tour! With over 70 breweries and nearly 700 food carts, our city has become famous for delicious brews and groundbreaking eats. On this tour we will visit three different breweries and two different food cart pods for tastings, tours, and eats - all while driving around Portland in our Eat Van and learning the local craft brewing and culinary scene. Meet your guide at the Heathman Hotel in downtown Portland, where your tour begins. Board and air-conditioned van and travel to our first brewery for 2 beer pours and farm-to-table eats to kick the tour off. Next, you will visit the first of our food carts where you’ll experience the community atmosphere of Portland’s food cart “pods” and eat some delicious food made from scratch in the cart. After the food cart pod, you’ll hop back in the van and drive through Portland’s neighborhoods towards the next brewery. Along the way you will learn about the history of Portland’s brewing scene and the neighborhoods we drive through. At the second brewery (third tour stop), you will enjoy 3 different beers and have a behind-the scenes peek of the brewing process. From the brewery, you will travel to another food cart pod for even more tasty treats and history on Portland’s culinary scene. There will be an opportunity for guests to purchase additional beverages at the pod if the desire strikes. As the tour winds down, you’ll head to the final brewery for dessert and yet another beer tasting. In total, you will eat enough food to account for about 1.5 meals, and taste 7-8 different Portland beers. Your tour ends back at the original starting point in downtown Portland.